There have been countless Swiss watch companies come and go over the last 200 years or so. 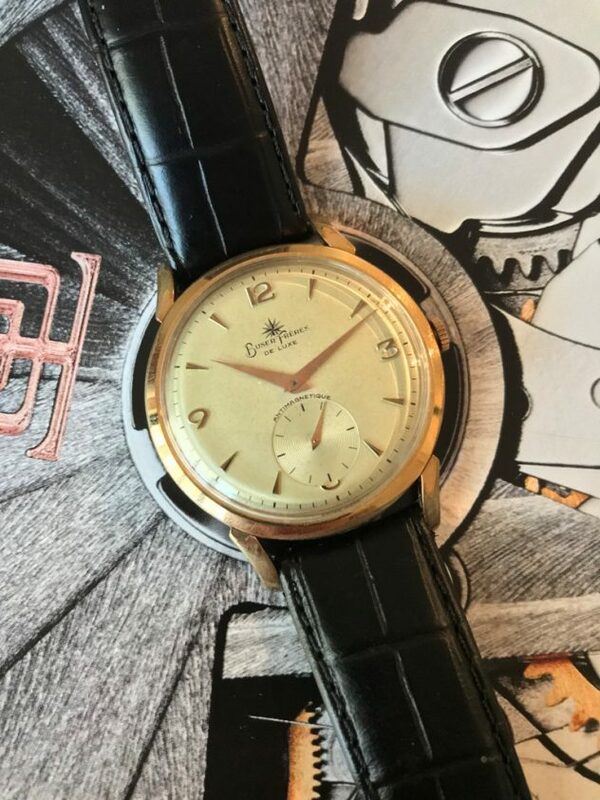 Literally every single day I come across at least one defunct name I’ve never heard of before, and I know of many Swiss watch brands (not to mention German and French brands too)! A sizeable proportion of these old brands were merely that – brands only, meaning that they did not manufacture any components of the timepieces they marketed. 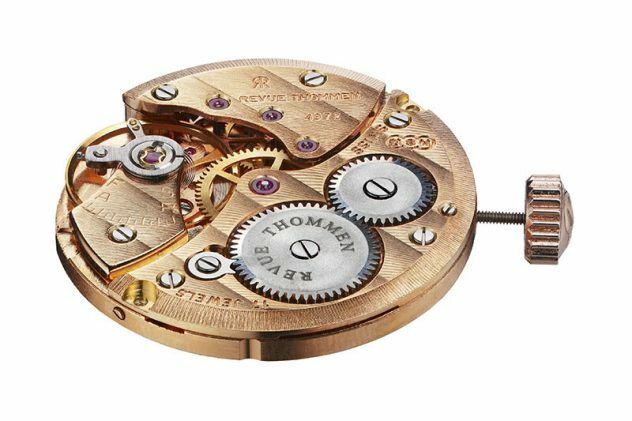 Rather, they designed (sometimes they didn’t even go that far…) or assembled watches from components supplied by other factories; a successful business model that continues today in the Swiss watch industry. Buser Frères & Cie S.A., a family owned business whose origins began in 1892 in Niederdorf, Switzerland; were a true ‘manufacture d’horlogerie’. Buser designed and produced select components and ebauches in-house. In fact Buser were responsible for over 20 calibers, both manually wound and automatic, including early cylinder and lever movements, open face hunter movements and chronometer-grade movements . Buser movements can be recognised most commonly by their trademark capital ‘B’ within a triangle, and were utilised by Buser’s sub-brands (Nidor, Frenca, Esta, Neo, Tiptop, Buwat and others) and other watch companies such as Gruen. Whilst Buser started off as an ebauche specialist, it wasn’t until 1916 that they were producing complete watches. Their finished timepiece capabilities ultimately included of course pocket watches and wrist watches; but also necklace watches and in-dash car clocks (possibly limited to the supply of movements to other car clock manufacturers). I believe Buser also manufactured their own cases and dials, although this is very difficult to verify due to there being little detail on Buser’s full watch production capabilities. 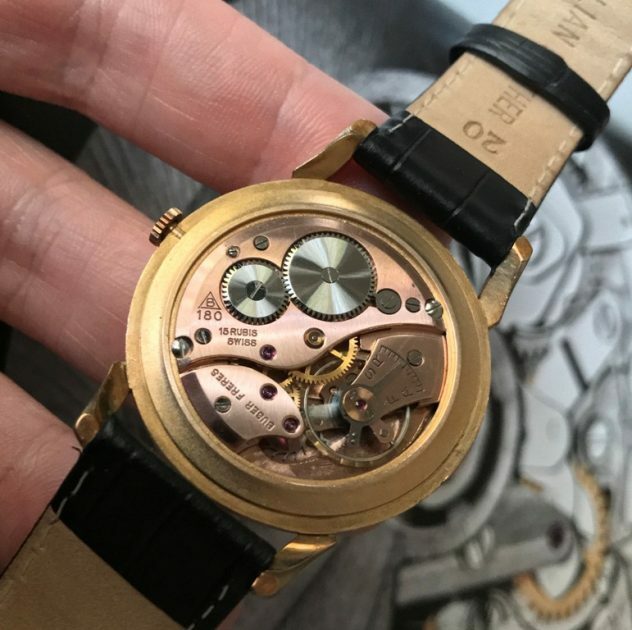 The vintage Buser Frères piece shown here, dating from the 1950s is powered by Buser’s nicely designed 13 ligne, 15 jewels, calibre 180 manual wind movement. At 38mm in diameter, this watch is large for its era. The beautiful dial has developed a lovely even honey patina over the years, and the slightly curved long lugs give the watch a very elegant look. 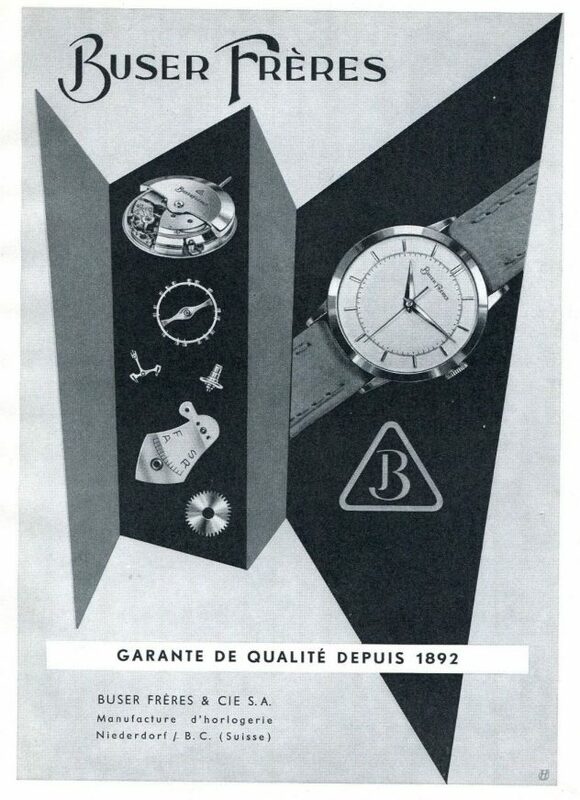 In 1961, Buser joined with Revue, Vulcain and Phénix to form Manufactures d’Horlogerie Suisse Réunis SA (M.S.R.). In 1973 Marvin also joined M.S.R. The Buser name started to take a back seat in watchmaking from there (as did Phénix), but Buser were reputed to have moved into pressure measuring instruments before seemingly disappearing as a company. However, Buser’s cal. 180 lives on today as the beautiful Revue cal. GT82, found in modern Revue Thommen watches. And Nidor (Buser) pocket watch calibres from 1918 are used by Zeno-Watch Basel in their limited edition silver pocket watch range retailing for 3000-4000 Euros! Buser Frères & Cie S.A. – a very interesting brand with a great history, but still one of the least known names in Swiss watchmaking. How is today’s Vulcain linked to current MSR? Modern day Vulcain are not directly linked to MSR any more. Vulcain are currently owned by a Luxembourg investor who also owns Anonimo. MSR are privately held and not in association with Vulcain.